by Cummins, Linda K.; Sevel, Judith A. This package includes the REVEL™ access card and loose-leaf version. REVEL is Pearson’s newest way of delivering our respected content. Fully digital and highly engaging, REVEL replaces the textbook and gives students everything they need for the course. Informed by extensive research on how people read, think, and learn, REVEL is an interactive learning environment that enables students to read, practice, and study in one continuous experience–for less than the cost of a traditional textbook. Guide students through all stages of the helping process and assist them in developing time-tested social work skills. 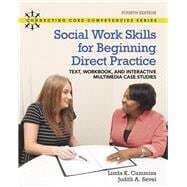 REVEL for Social Work Skills for Beginning Direct Practice: Text, Workbook and Interactive Multimedia Case Studies, Fourth Edition, provides social work students with the social work practice knowledge and skills required for engaging in a successful helping process with clients. The integrated text, workbook, and interactive multimedia cases allow students to explore how to use social work skills in each stage of the helping process–from engagement and intake through termination. Students learn about attending behaviors, basic interviewing skills such as lead-in responses, paraphrasing, and reflection of feelings, and more advanced skills such as confrontation and summarization. Students then learn how to apply these essential interviewing skills in order to work effectively with diverse client groups. Social work theory, policy, therapeutic approaches, and evaluation techniques are integrated throughout the book to provide the essential elements of direct social work practice. The new edition includes expanded content on cultural competency, cultural awareness, evaluation, and client termination and keeps students up-to-date with the information they need to provide thorough, effective, direct social work practice with diverse client groups. NOTE: Before purchasing, check with your instructor to ensure you select the correct ISBN. Several versions of Pearson's products exist for each title, and registrations are not transferable. In addition to the access card included in this package, you will need a course invite link, provided by your instructor, to register for and use REVEL™. If purchasing or renting from companies other than Pearson, the access code for REVEL may not be included, may be incorrect, or may be previously redeemed. Check with the seller before completing your purchase. Dr. Linda Cummins earned her MSW and PhD from the Ohio State University with a focus on homeless populations, rural women and communities and policy practice. She has been a social work researcher and educator for 25 years in the bricks & mortar, and online environments teaching courses in research methodology, social policy and social welfare, and ethics and diversity; and, conducting research with homeless populations (rural, urban, Appalachian women, poly-addicted severely mentally ill), community partnerships among social service agencies, and technology in social work education. Dr. Cummins has served as chair of many curriculum and technology committees, as an online curriculum designer and consultant, and has presented at national conferences on diversity in social work practice and education, homeless populations and service provision, technology in social work education, and ethic of care for aging populations. Dr. Cummins is author of Policy Practice of Social Workers: New Strategies for a New Era, with co-authors Katherine Byers and Laura Pedrick. Dr. Cummins is currently a professor in the graduate school of Northcentral University where she chairs dissertation committees across disciplines and serves as the co-chair of the Institutional Review Board. She resides on her multigenerational organic farm on the South Coast of Oregon. Judith Sevel is a graduate of the University of Pittsburgh (BASW) and Howard University (MSW), and has been a social work practitioner and educator since 1984. She has practiced in the fields of mental health, domestic violence, family and children services, incarcerated juveniles, and people with developmental disabilities. Recently she retired from Illinois State University, after serving as the Director of Field Education for the BSW and MSW programs. While at ISU, Judith taught courses in interviewing and assessment, and Field Seminar classes at all three levels of practice. Judith has been a disaster mental health services volunteer and a facilitator for the Reconnection Workshops for Military Families through the American Red Cross since 2001. She is also a certified mediator in Small Claims, Child Protection, and Divorce and Custody mediation with the 11th Judicial Circuit Court in McLean County, IL.